There was a thread on this subject last fall and everyone said they have never had the fans come on by themselves after shutting off the car. However, there is a way to test the circuitry, (and that leads to a way to make a fan timer). There is a single black wire (with connector) coming out of the ECU that is not attached to anything. To test the fans you need to attach this wire to ground for two minutes while the car is running. With the wire still grounded, turn the car off and the fans will stay on. After 30 seconds, un-ground the wire and the fans switch to low speed. The fans stay on for ten minutes. The ECU is down in the passenger side foot well. You need to pop off the door sill trim and then pop up and remove all the fasteners holding the foot well panel. Best to go slow with this as the plastic stuff will crack easily. Once the panel is removed you can see the ECU mounted to the chassis. The test lead on mine was just hanging there, toward the front, but I remember someone saying they had to remove the ECU from its mount to get it. The lead is black and has a female spade connector on it. You should test the circuit first to be sure it works. I used a male spade connector end and an alligator clip test wire. Connect it to ground for a little more than 2 minutes while the car is running. Turn the car all the way off and the fans should be running. After 30 seconds disconnect the wire from ground and the fans should switch to low speed and stay on for 10 minutes (it's timed not temp controlled). I ended up installing a stock foglamp switch in one of the blank switch holes on the center console. (Almost any switch will work, doesn't have to be the Mazda foglamp switch at $50.) I ran one wire from the switch to the ECU test lead and the other to ground. I just engage the switch 2 minutes before I turn the car off if I want the fans to run after. I didn't. Besides the foot well cover, you have to pop up the center console to mount the switch. I used in-line spade connectors at the switch end and ran 2 twelve gauge wires from the switch, under the center dash, up over the foot well behind the dash under the glove box and down into the ECU area. At the ECU end I used a male spade connector for the test lead and a ring connector which I mounted with another ground wire on the door side of the ECU. I've had this hooked up since last September. I don't know if it cools the engine off any faster but I can tell you that the engine compartment does cool off faster which can't be bad for all the plastic and rubber in there. I only use it when it seems appropriate but have not seen any affect whatsoever on the battery. Don't ground the wire all the time as the fans will run all the time. Be sure to allow for a cool down for the oil in the turbos. >Is the "cooling fan control module" the small black plastic box? Yes, it's the black plastic box mounted behind the ECU. It works, I just hooked everything up yesterday and the fans work exactly as you said!! Only one thing, my wire was behind the CPU and it was Black and Greenish/Yellow-striped, however it was the only loose one and it controlled the fan relays, I could hear it clicking them when I had the key on all the way without starting. First, on finding the wire. Some people said theirs was hanging there, but mine was behind the PCME. Unbolt the three bolts (2 on bottom, one on top-right) and pull the PCME away from the panel. Behind it, the small black box is the fan control module. It has one harness coming out with 5 wires. One of them is a black/yellow. Follow that down and you should find a loose black/yellow wire. At the end is a black plastic harness, which shields a female spade connector. If you mount a switch on the center console, you can run the ground to any of the bolts there--no need to ground it at the PCME. In a nutshell, here is how the fans work: There are 4 relays. Fans are wired in parallel, so speeds are same for both. Relays 2&4 operate in parallel, too. Relays 2 & 4 controlled by PCME, come on when temp reaches 221F. Relay 1 controlled by A/C switch. Low speed comes on when relays 2 & 4 are active. High speed comes on when all are on. The fan controller can bypass the 226 thermoswitch and fake out the relays 2 & 4. Grounding the test lead _immediately_ turns on relay 3. When you ground the test lead then the fan controller waits 2 min and turns on 2 & 4. If the test lead grounded for 2 minutes before engine shutoff, relays 2,3,4 will be kept on. So there are several permutations depending on what the driver does and the state of the car. I created a quick web page that contains some information about how the fans are controlled and what the fan mod actually does (along with instructions on how to force the fans into different speeds). As promised, last weekend I used thermal strips to test the underhood temps after shutdown, but with the fans running for 10 minutes on low (Fan Mod). The previous weekend I conducted a similar test, but without running the fans after shutdown. The difference in temps were were amazing! Those who flamed away at this idea when it was discussed on the list a month or so ago can now put your tails between your legs. Both tests (with & without the fan mod) were conducted after driving the car on the freeway for 20-30 miles with some periods of light boost, and an ambient outside temp of around 80degf. The car was idled for 1 min before being turned off & was allowed to sit for at least an hour afterwards. The test with the fan mod was done with the switch turned off after 30 seconds thereby switching the fans to low speed. The thermal strips were added prior to the 20-30 mile trip, but were checked after shutting the car off (before heat soak) for a baseline. Only IC intake tube registered on both tests (all others were less than 140degf before heat soak). An interesting note is that the IC intake temp strip increased by 10degf on each test after shutting the car off, even with the fan mod. The explanation I came up with for this is that some residual heat from the turbos rose to the highest point in the system, which is the IC intake pipe. It is a slight pain to remember to turn on the switch 2 min before shutting the car off & to wait 30sec after shutting the car off to turn the switch off (fans on low), but it's worth it in the long run! The fan mod does cause clicking of some the fan relays(4 on the right inner fender) because it turns some of them on. The black box is nothing more than a clock and timer. It connects to the ECU at the same point as the thermo switch which also connects to fan relay #3. If you ground the control wire about 2 minutes before the engine is turned off and the engine is hot( I don't know the temp), it will keep the fans running for about 10 minutes. Then if you also open the circuit while they are running with the engine off, the fans will still run but at a lower speed. If you ground the thermo switch at #3 relay, it will also turn the fans on but doesn't keep them going when the engine is turned off. With the engine turned off, grounding any of the above two wires will cause the relays to also click but the fans will not come one. 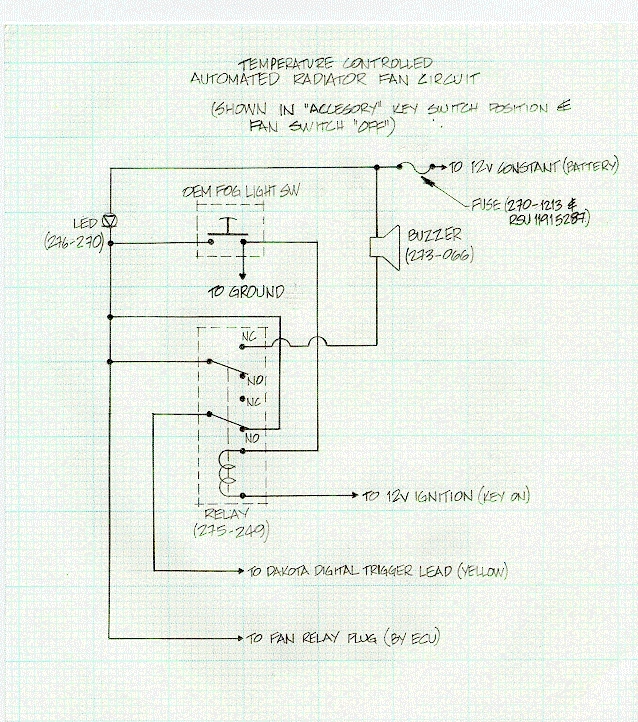 Looking at the circuit schematic, you would think this would not happen because the ignition switch is open/off. But the hot wire (12V+) from the switch also connects to the ECU and electrical load unit and must also receive some current thru them. ...This does work instantly (no 2 minute wait). This may not apply to the third gens, but I have an 89 conv. and have replaced the clutch fan with a 16 inch electric fan. I installed an electronic thermostat control and run it directely off the battery. It will run after the car is turned off until the temp in the radiator is below 160 degrees. I have had no problems with running down the battery and the car does seem to cool down faster. The electro-thermostat costs me 29.00 at pep-boys. The resistor should be a 1/4 watt rated +/-5%, (Radio Shack should have these) and connect the resistor from the terminal going into the ECU and ground, (recommend having the resistor in the passenger area, not the engine area). This puts the resistor in parallel with the temperature sensor. >From what the ECU does at various temperatures, IMHO the 4700 ohm resistor looks like a good starting point. Please note that I have not checked out other functions of the ECU as to what changes in operation due to slightly modified engine temperature readings. >Miata and spliced in the RX7 harness. I would agree with selecting another thermo-switch, other than this is almost too late because the fans should also come on earlier for the lower speed. I have experimented with adding a resistor across the ECU's engine temperature leads. This causes the ECU to think the engine is running hotter. I have found that using a resistor value of 3300 ohms, the fans come on about 5 F sooner. I went ahead and put the 370 ohms resistor across the thermosensor connector so you guys can feel free doing it yourself and try these resistor value. I am going to run this on my car for at least a week and see if anything goes bad so some of you might want to wait. :-) There is one new sympton that I notice that was never there before. If I turn the parking lights on, the fans kick in right before it reaches to that trigger point. I wonder if this is true without the resistor at higher temperature. The ECU uses the same thermosensor to also figure out how much oil to inject and also how rich or lean to make the air/fuel mixture. By adding the resistor across the thermosensor you are fooling the ECU into thinking the engine is hotter than it really is. Thus the air/fuel mixture will be too lean for any given engine temperature. Can you say detonation? Are you sure that the water thermosensor can change the a/f and oil injection to the car? There're 3 thermosensors in the car. Fuel, air and water. I would think that the fuel controls the oil injection, air controls the a/f mixture and water for car temperature. Am I wrong on this one too? Looking at my control diagram, I think the water temp sensor is used during warm-up to richen the mixture, but the air temp is the main a/f runnining input. Don't know about oil inj. I found that my 93 will kick the fans on low at about 190F if the parking lite is on OR if the cabin fan is at 3 or more (probably crosstalk/feedback thru the EL circuit). I routinely use one of these options to keep at 190F at low speed/traffic, etc, vs the stock 220F kick in. Not needed on the highway, cruising. T-stat will keep temps at about 190F anyway. > .... Matt Severson programmed an inline interpreter. Sounds great. But, if Matts modifier doesn't happen, I will use a simple dp relay and the thermo-switch to kick in a shunt resistor to make the departure from 'normal' occur at 230F, vs about 250F now as I recall. This, with a 210F single wire thermo-switch (miata?) should do it. Very simple, just need to find ign hot under the hood to power the relay. The oem wiring diagram suggests the 220F low speed ecu signal must be active for the 226F med speed fan to kick on. But the fan-mod recall diagram shows related wiring changes. My fans (recall done) now come on whenever I throw my manual gnd switch. So a low temp thermo-switch should at least work for some models. Severson messes with the gauge-sensor system, no influence on other control systems. The dumb 226F thermo switch does nothing but move fans to med at 226F. As I noted, a lower temp switch should work on many/most cars with fan recall done. A reasonable temp would be 210F, well above t-stat opening point for fully warmed engine. It would be just like hitting the manual 'mod-switch' at 210F for a short time, based on the recall wiring diagram. If the manual switch works at low temps, a lower temp thermoswitch will work. Miata thermoswitch 207F? may do it. These are the 3, distinct, coolant temperature sensors/switches. Just ground TFA in the diagnostics connector - this is connected to Fan Relays #2 and #3 so will run the fans at low speed when cool, then will go faster should your water temp get hotter. You will put more strain on the battery since they will be drawing juice when you try to start the car. Automate the activation of the cooling fans at a preset temperature - I have set my Water Temp. Gauge to activate at 191 deg... (or 190 deg... as the high level). I find that under sporadic boost periods, the fans keep the temperature at or below 190 deg. almost constantly. While the fans are active (via this circuit), an indicator LED turns on. Display a warning light/indicator LED while the cooling fans are turned on either automatically by the add-on circuit, or when the switch is toggled (closed) - When approaching a destination, I toggle the switch (in my case, an additional OEM fog light switch mounted in the center instead of the dummy cover) at the required time before shutting down the engine. The indicator LED turns on. As a reminder, activate a buzzard when the switch is toggled (closed) AND the key is turned off - As the key is turned off and removed, the buzzer turns on to remind me to toggle the switch back to "OFF" after the "30 second" delay, slowing down the fans and ultimately shutting them down after 10 minutes as intended by the original "Cooling Fan Modification". I scanned the sketch into a JPEG (400 KB) and have included the part numbers (Radio Shack) of the parts I used. Alternatives can be used where appropriate. Reply if you are interested and I will forward the JPEG to you. >control module? (hint: answer should consist of colors). The factory harness sends Red/Yellow and White wires for this duty. I'm not sure whether those colors continue after the switch connector (and too lazy to take my car apart to see!). Subject: (rx7)  Variflow fan mod installed. Today I installed the PSM Variflow fan unit. I received the package a bit late (2 weeks) but upon receipt I was very impressed by the quality of the unit. The control-box is no larger than a pack of cigarettes. It has generous coils of high quality wires for the DC power and fan outputs pre-soldered to the unit. There are numerous inputs, one for switched +, A/C switch and the thermo-sensor. I opted for the "temp-clip" thermo-sensor for installation simplicity sake. I mounted the unit on top of my intercooler duct adjacent to my MSD. It requires some cooling space around it so this placement worked out great. Installation was almost uneventful. I determined the "high" speed of the fans to be the green and black wires, green being positive. I used two pairs of female spade connectors to attach both the positive and negative leads to the fan outputs, chaining them from one fan to the other. I also discovered at this time that the A/C input wire actuates the fans on a 25% speed no-matter the ignition position. I will hook this to a cockpit mounted switch in concert with the A/C clutch to allow for "engine off"cool-down between runs. I drove around for 30 minutes in stop and go traffic with the A/C on without the compressor wire attached to further load the cooling system. The temp needle maintained 180 degrees +/- 5. As a final test I let the car idle in the driveway for another 20 minutes (A/C off). The needle didn't deviate more than a hair from 180 on my AM temp gauge. The ambient temp was 55. The fans were almost imperceptibly silent the entire time. The fans operate in a weird silence. The pulse-width modulation gives a very subtle hum upon startup and slow running. It starts the fans very slowly accelerating them to desired speed and decelerating them equally slowly. Nice and efficient. Good for the fans and electrical loads. Based on my initial observations I feel the Variflow is a damned good product. It doesn't load up the electrical system nor is it noisy and obtrusive. It did require a bit of fiddling to find the best sensor placement but beyond that installation was straightforward. Judging by the meager (and near-silent) fan-speed the unit was operating at during my initial tests I would say summer running should prove more than satisfactory. Not bad for $100. Good stuff. It was worth $10 for me not to have to build the timer. *disclaimer* Do this at your own risk. As always, if you screw up your car, it's your fault. Be careful! Order your timer. I found it from another website for $20, but they didn't look as reputable. Mount the relay-timer. (I used an empty 3in by 3in washer container made of thin clear plastic. If you don't know what I mean, go to a home improvement store and look in the hardware section. They sell washers in small plastic containers.) After mounting the timer in my washer container, I cut a small hole in the end to run the wires through. There was room on top of my PFC so I just set the container on top of it. Test it. Warm up your car. Test your fan mod switch. It should work exactly as before. Turn it on, you get fans. Turn the fan mod switch on for 2 min. Turn the car off. Leave the fan mod switch on. After 30 seconds (or whatever you set R3 to) the fans will go to low speed for 10min just like before. When you start the car back up, the fan mod switch is back to normal. Enjoy being able to turn your car off and hop out right away without feeling guilty. Notes : I have only had this mod on my car for today, but it is working perfectly and I don't expect any problems. There are probably better ways do this that would avoid having to turn on the switch 2 min before you turn the car off. I like the way the fan mod works and didn't want to screw around with the wiring of the fan relays. The fact that the fan mod switch works exactly as before is a plus. I don't recommend leaving the switch on all the time (when the car is cold, highway speeds, etc). This is only the breadboard part of the project. You need to add some noise filtering and bypassing stuff so the first time you drive past a 500 MWatt AM station or through a thunder storm you don't get the chip fried. You need something like a 25 volt varister(?) for voltage spikes and a small value ceramic cap (100 pf for high frequency RF) across the supply leads. I haven't done this stuff since 4 MHz 8 bit Z80s were the hot thing so I may have it a touch wrong. But if you're going to put your own electronics project in a car, you have to protect it. The commercial electronic equipment has it designed in - and they still sometimes die.